Easily move furniture across your carpet and hard surface floors, including hardwood, laminate, tile, vinyl and other resilient floors, during moves and cleanings with furniture floor slides and furniture glides. 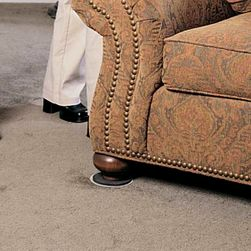 Some furniture glides have felt bottoms for easy moving across hard surface floors, while others feature hard bottoms to move bulky items seamlessly across carpeting. Furniture glides and slides may also help minimize or eliminate scratches or carpet pulls due to objects sliding or being pushed across the floor. Each slide is made to make furniture moving easier and safer so you can move hefty furniture for cleaning, vacuuming, moving and rearranging quickly while reducing back strain. 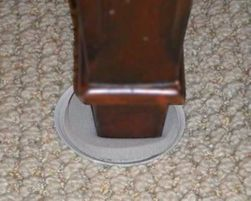 Furniture glides, sometimes called "permanent slides," are typically smaller than carpet sliders and are meant to be placed under furniture or equipment for long periods of time. 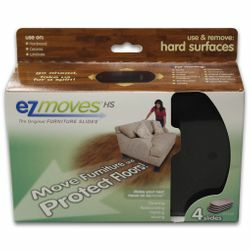 These items are great for furniture or equipment that's regularly moved. 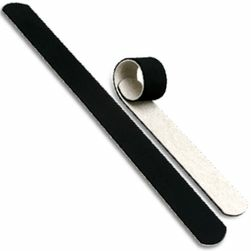 Heavy-duty furniture slides with oversized felt may be used to move bulky appliances on hard surface floors. At 1877FloorGuy, we have a furniture floor protector designed to meet your specific needs, including various sizes and lengths for moving small and large items. 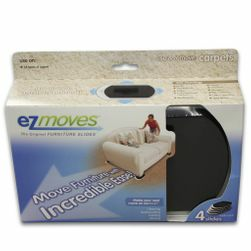 Brands like EZ Moves and Slide-All offer multiple designs and colors of carpet sliders that make moving furniture easier than ever. Slides and glides are sold in sets of two and four at 1877FloorGuy.